A lightning arrester is a device used on electrical power systems and telecommunications systems to protect the insulation and conductors of the system from the damaging effects of lightning. The typical lightning arrester has a high-voltage terminal and a ground terminal. When a lightning surge (or switching surge, which is very similar) travels along the power line to the arrester, the current from the surge is diverted through the arrestor, in most cases to earth. In telegraphy and telephony, a lightning arrestor is placed where wires enter a structure, preventing damage to electronic instruments within and ensuring the safety of individuals near them. 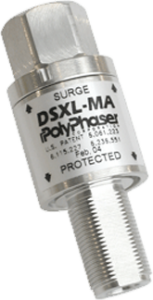 Smaller versions of lightning arresters, also called surge protectors, are devices that are connected between each electrical conductor in power and communications systems and the Earth. These prevent the flow of the normal power or signal currents to ground, but provide a path over which high-voltage lightning current flows, bypassing the connected equipment. Their purpose is to limit the rise in voltage when a communications or power line is struck by lightning or is near to a lightning strike.